We've collaborated with Farm Sanctuary to create a merchandise collection inspired by Tracey's new book, Do Unto Animals! 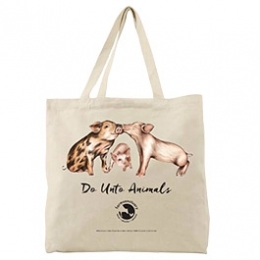 T-shirts, notebooks, tote bags and prints all custom designed by Do Unto Animals illustrator, Lisel Ashlock, and available exclusively on Farm Sanctuary's online shop! We couldn't be more excited to see these products come to life! This holiday season, feel good about spreading the Do Unto Animals message and supporting Farm Sanctuary with every purchase. Whether you’re a budding author or a casual writer, these notebooks will inspire compassionate commentary on the world around you. 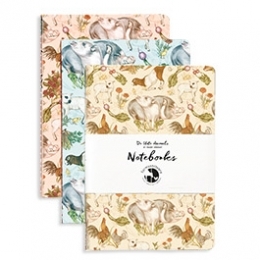 Featuring custom patterns by Lisel Ashlock for Tracey Stewart’s Do Unto Animals, these journals are a great way to show your love for animals and support their well-being. 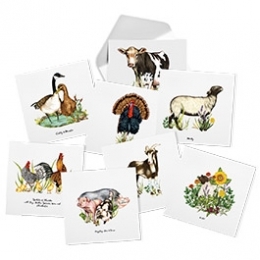 Set of 3 journals, 5" x 7"
Holiday note cards featuring the residents of Farm Sanctuary: Patrick; Shy Joanne; Pugsley, Jane, and Diane; Oleander; Hank; Speckles, Thurston, Jay, Junko, Sparrow, Wren, and Chickadee; Ciddy and Masala; and Violet. These ambassadors represented their species in Do Unto Animals, and they'll continue to spread cheer through the end of the year. Set of 16 cards with envelopes (8 images x2). Did you know that pigs choose their very own best friend? Farm Sanctuary's Ramona has chosen the buddy she wants to eat with, sleep with and play with. Ramona and the other pigs at Farm Sanctuary are ambassadors for the millions of pigs who are mistreated and misunderstood. This tote shows the world just how loving they really are. Chicks are highly attuned to their mothers and to one another. The Flocker Siblings feature in Do Unto Animals and are a fine example of a couple of chicks who stick together. 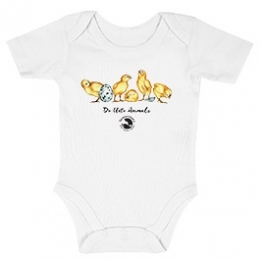 Dress your little hatchling in this adorable onesie and show the world that your baby will be an animal lover for life! 100% cotton. 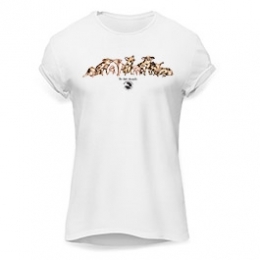 Sizes: 3-6 months, 6-12 months, 12-18 months, 18- 24 months. This pig tee features illustrations from the Real Pig Latin spread in Do Unto Animals. Farm Sanctuary’s Ramona will help your child inspire positive conversation about the amazing animals on the farm, spread the word about our pig friends and teach others how to speak their language. 100% cotton. Sizes: Small, Medium, Large. 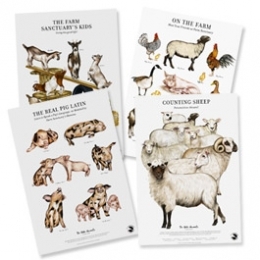 Lisel Ashlock, illustrator of Do Unto Animals, has created these four fine art prints featuring the animals of Farm Sanctuary. With these posters, you can bring the Farm and the emotions it carries back home with you. Set features 4 fine art prints: On The Farm, Counting Sheep, Goat Playground, and Pig Latin. Prints measure 13" x 19" and are printed on heavy weight paper. 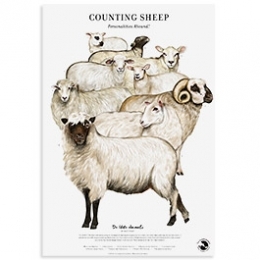 Counting Sheep invites you to count the multiple qualities and personalities that sheep possess. 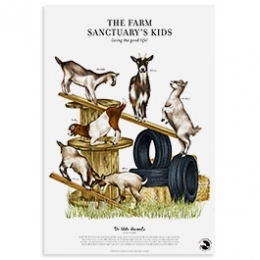 This poster-sized illustration by Lisel Ashlock for Do Unto Animals features Farm Sanctuary residents Bear, Joanne, Francis, Madeline, Cash, Grace, Ramsey, Daniel, and Katherine. Print measures 13" x 19" and is printed on heavy weight paper. The kids of Farm Sanctuary love their playground. The goats in this poster-sized illustration by Lisel Ashlock for Do Unto Animals encourage you to embrace your playful side. Featuring Farm Sanctuary residents Clarabelle, Gloven, Goodwin, Kathy, Curry, and Allene. The Farm Sanctuary animals are wonderful ambassadors for transforming hearts and minds. 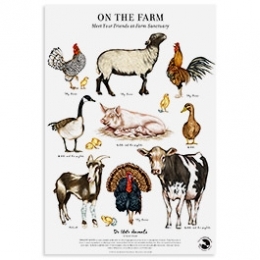 This poster, with illustrations by Lisel Ashlock for Do Unto Animals, features residents Speckles, Shy Joanne, Thurston, Ciddy, Nikki and her piglets, Masala, Patrick, Oleander, and Hank. Pigs are intelligent, social, and playful creatures. They are also one of the most misunderstood animals. 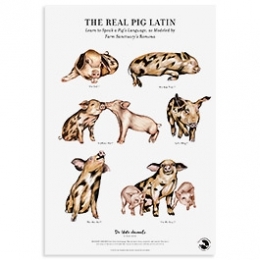 The Real Pig Latin is an illustrated spread by Lisel Ashlock for Do Unto Animals that teaches us the language of pigs: their complex social structures and their human qualities. 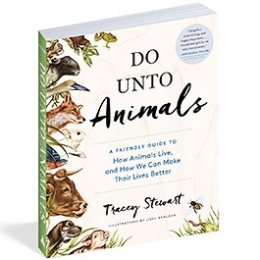 Do Unto Animals is written by Tracey Stewart with all proceeds being donated to Farm Sanctuary. Part practical guide, part memoir of her life with animals, and part testament to the power of giving back, Do Unto Animals is a gift for animal lovers of all stripes. Adopting or sponsoring a sanctuary resident is the perfect way to add a farm animal to your circle of friends. 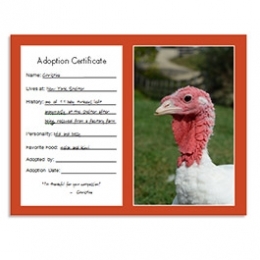 A gift adoption through Farm Sanctuary’s Adopt a Farm Animal Program, provides food and shelter for a needy farm animal and creates a lasting bond between the adopter and the animal. Last minute shopping? Don't hit the shops, give the gift of giving instead. Absolutely love the illustrations by Lisel. She is so talented! Tracey, I was fortunate enough to see you at Book Passage in Corte Madera and pick up a couple of copies of your book. I love this book so much, I’ve been buying copies for just about everyone I know—every time I hit a book store and see it, another one goes in my basket! Your talk about the book and your sanctuary plans moved me beyond words and inspired me to make as many changes—small and large—in my own life as I can. My dream is to retire in four years, relocate to some land in the Pacific Northwest, and start a dachshund rescue/sanctuary. I’m an animal lover through and through, and you’re my hero! Keep up the good work! !